Aikido (合気道) is a Japanese martial art developed by O Sensei (Great Teacher) Morihei Ueshiba as a synthesis of his martial studies, philosophy, and spiritual beliefs. On the philosophical side, O Sensei emphasized the moral and spiritual aspects of this art, placing great weight on the development of harmony and peace. Aikido is often translated as “the Way of harmonious spirit” or “the Way of Harmony.” Although the idea of a martial discipline striving for peace and harmony may seem paradoxical, it is the most basic tenet of the art. O Sensei’s goal was to create an art that practitioners could use to defend themselves while also protecting their attacker from injury. Aikido is a form of Budo – a way of life that seeks to improve the self through a blend of rigorous physical training and spiritual discipline. In many martial arts, an attack comes and is stopped, and then the defender counters with an attack of their own. In Aikido the attack is not stopped, it is transformed. This is accomplished not by overpowering the attacker but by blending with their energy and incorporating it into your technique. One can say that this blending uses the attacker’s force against their intention. The aggressive action of the attacker is used to stop that aggression. Aikido is an art of defense against an unprovoked attack; a commitment to peaceful resolution of conflict whenever possible. 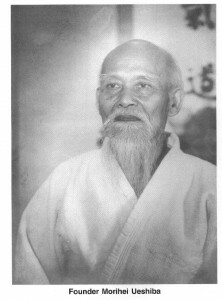 Its uniqueness as a martial art lies in its awareness of a deep sense of harmony with all of creation, therefore, training is designed to defend not only the self, but to bring the attacker under control without the necessity of inflicting injury. In Aikido, one never meets force with force, but skillfully avoids confrontation to harmonize with the attacker’s movement. Aikido teaches the peaceful, non-violent resolution of conflict by combining various self-defense techinques based on the traditional Japanese sword, spear, daito-ryu aiki-jujitsu and other martial arts. From the first moment of practice, the emphasis is on the integration of mind, body and spirit. Since strength is not an essential element of Aikido, muscles and bodybuilding are not necessary. Consequently, it is an ideal martial art for men, women and children of all ages and physical abilities. Aikido is performed by blending with the motion of the attacker and redirecting the force of the attack rather than opposing it head-on. This requires very little physical energy, as the aikidōka (aikido practitioner) “leads” the attacker’s momentum using entering and turning movements. The techniques are completed with various throws or joint locks. Aikido can be categorized under the general umbrella of grappling arts. Historically speaking Aikido derives mainly from the martial art of Daitō-ryū Aiki-jūjutsu, but began to diverge from it in the late 1920s into an autonomous art. Today aikido is found all over the world in a number of styles, with broad ranges of interpretation and emphasis. However, they all share techniques and philosophy learned from O Sensei. The Cleveland Aikikai, affiliated with the World headquarters Hombu Dojo, is a member dojo of the Aikido Schools of Ueshiba, an international Aikido organization founded by Mitsugi Saotome Shihan, a long time direct student of the founder.